Warlords – Crystals of Power is one of Net Entertainment’s newest creations, released in late 2016, and while the game’s still relatively new, it’s impact on the Video Slot industry has already begun to emerge; players love the game, and the dynamic range of features and bonuses on offer make playing a varied, unexpected, and exciting experience. Warlords – Crystals of Power is designed for both desktop and mobile devices, and will run flawlessly on the majority of mobile phones and tablet devices. While a 4G or WIFI connection is recommended, Warlords – Crystals of Power is designed to use minimal system resources, and so should work perfectly on weaker Internet Connections, as well. The game itself is a 5 reel, three row setup, and it uses 30 pay lines; these are fixed, and cannot be changed by the player. The general theme of the game is set around a battle for power, with three different Warlords battling it out for power. You’ll see all three Warlords as stacked symbols on the reels – the high-paying symbols – and their pets, and masks make up the remaining symbols. The wild symbol is designed to look like three coloured Gems, built into a Gold piece of jewellery, and the scatter symbols are three different-coloured flags; Green, Red, and Blue, each representing one of the Warlords. 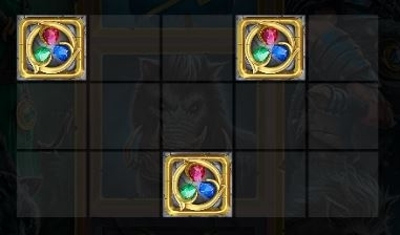 During the base-game, once you’ve pressed spin, you may randomly be awarded one of the random overlay wilds. Priestess Arrow – Adds 2 to 5 wilds to the reels, in any position. Samurai Sword – Adds 2 to 5 wilds on reels one to four only. By far the biggest highlight of the game is the free-spins bonus, and this is triggered by landing three of the same-colour flag on the middle three reels. If you land two flags, of the same colour, you get a second-chance to land the third required; this comes in the form of random flags landing on the reels, and can award anywhere from one, to up to 9 scatter symbols on the screen. If you fail to land a third scatter symbol this way, you then get once last chance, in the form of a meteorite hitting your screen. The symbol it hits, will then either turn into a scatter symbol, or award a cash prize. If you land two scatter symbols of different colours, you’ll then see a short battle scene, where the flags “fight it out”; the winner becomes the colour scatter symbol you’re left with, and the second-chance feature then takes place, as detailed above. 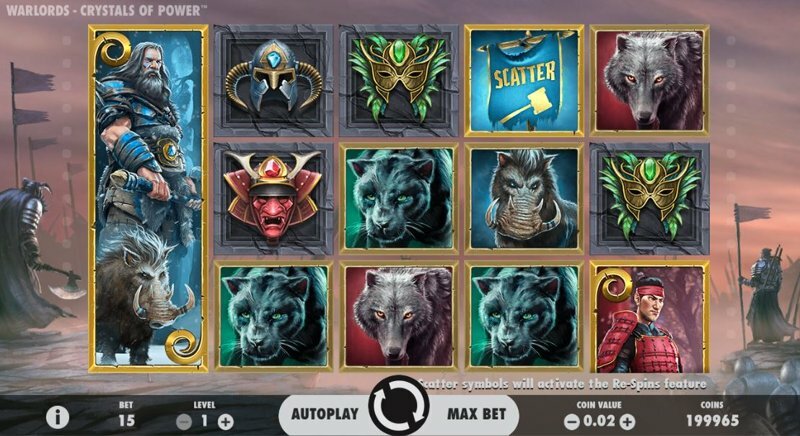 Land the blue scatter symbols, and you’ll be awarded nine free-spins, with only the Barbarian and the low-paying symbols on the reels. 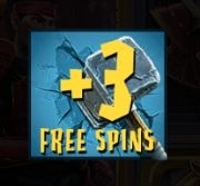 During the free-spins, every time you land one or more scatter symbol (only the blue scatter symbols appear during the bonus), you’ll be awarded more free-spins, with each symbol giving you an extra 3 free-spins. 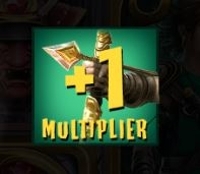 If you manage to land three or more of the green scatter symbols, you’ll be awarded the Priestess free-spins, and here, you’ll be given 7 free-spins, with each scatter symbols increasing the multiplier by one. For instance, if you landed 6 green scatter symbols in the base game, you’d start the free-spins with a 6X multiplier. You can’t re-trigger these spins, but you can reach quite a high multiplier, by landing more green scatter symbols during the free-spins. By far the most profitable of the free-spins bonuses (and the hardest to get), the Samurai Free Spins lock the red scatter symbols in place, which turn wild, and stay for the remaining free-spins. It’s possible to have anywhere from 3, to 15 (a full screen) covered in these sticky wilds, and generally, this bonus will always pay well – it’s landing it that’s the hard part. 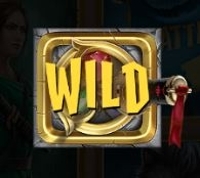 As the scatter symbols turn into sticky wilds, you can’t re-trigger any more free-spins, and are stuck with the initially-awarded 5.